We planned to be in Spain for just over a week, giving Mary the chance to find out a bit about touring there and also to visit Chris in Sitges. It came as a surprise to discover the variety of experiences you can get in one small area in so short a time. Our stay at the farm was punctuated by the sound of a distressed donkey braying. At first we thought it was a creaking gate followed by a strange creature sobbing in loud distress all amplified by some electronic wizardry. It took some time before we realised that it was a donkey and one that was too frustrated to bray politely. We were regularly startled by the honking, creaking, howling, sobbing noise that ripped the air and we would freeze before remembering what it was. On the last evening, Mary decided to return to the farming museum to choose an object to sketch. While she was in there, one of the staff invited her to come out to the yard where the animals are kept. It was here that she encountered Charlie the randy but unloved donkey. Charlie (not his real name – this has been changed to protect the innocent), was in a pen with two female donkeys, one of which he was desperately attracted to. Unfortunately, she was completely unimpressed by his charms and every time he attempted to mount her she grumbled loudly before lifting her back legs and giving him a thorough battering. At this point he let rip, sobbing and groaning, before preparing himself for another try. In the two days we were there he remained faithful to his task, howling and groaning every hour or so. They say that persistence pays off but not for poor Charlie who is probably still trying. We set off in good time for our drive to Sitges having made absolutely certain that the satnavs were set to a longer but easier route around Barcelona. On every visit before this one we have been seduced into believing that the route through the city is shorter in miles and therefore preferable. It is a wicked lie. Shorter in miles possibly, yet it takes years off your life. Sitges is just south of Barcelona and it is our favourite place in Spain. Of course we are biased because Shirley’s brother lives there but it is also a lovely, classy, friendly resort with lots of great places to sit and eat or drink and people watch. There are two possible places to stay in a motorhome near the town, if you don’t want to use one of the campsites. One is an official aire and it is dire. It is sloping, messy, dirty and a very long way from town. We have yet to see anyone actually staying there for any longer than it takes to use the services – and they are grubby and unkempt. This state of affairs is a mystery to us as Sitges is as spick and span as can be. The second place to stay is a provisional aire much nearer the town and right next to the railway line. It has no services but it is flat and accessible and an altogether better option for a couple of nights in this fine town. After mid October you can also stay on the sea front but we were too early to take advantage of that option. We parked next to one another and discovered that the spaces are so small that we could very nearly step from one van right into the other. Fortunately we’re all good pals. It is about a mile along the sea front to the centre of Sitges and we walked up and down there several times on our three night visit, although sometimes we cheated and took the little tourist train that rumbles along the long prom several times a day. Shirley and Chris – two peas in a pod. It was Mary’s birthday on the second day and she decided to spend it in Barcelona, discovering the fantastic architecture of Gaudi. From Sitges it is easy to take the train into the centre of Barcelona – it takes about 45 minutes and costs less than 4€ each way. Mary came back at the end of the day foot sore but inspired. We, on the other hand, wandered into town in the heat of the afternoon, resisted an ice cream, resisted a beer and walked back with a few random items from the Chinese Bazaar. In the evening we all walked back into town to properly celebrate Mary’s birthday in Parrots Bar and Le Patio restaurant – more on that below. Incognito is a delightful café bar where the food is served by Eric and Juan Carlos. Eric is one of the owners of the restaurant and a wonderfully charming Frenchman. Secretly I would have liked to take him home with us. When he brings the menu of the day he tells you about every item in his delicious French accent. He describes how it is cooked, the main ingredients and how it tastes. By the time he is finished we are in ecstacy and we haven’t eaten a thing. Juan Carlos serves the food with great warmth and a little gentle humour, looking after you as though you are the only people in the restaurant, when in fact you need to reserve a table in advance because it is so popular. At the end, once they get to know you, they kiss you goodbye. Really – what could be more delightful? We met there for lunch with Chris and left several hours later full of good food and feeling fabulous. Parrots Bar is a pub where all the outside tables are quickly filled with people watchers. Each evening we met Chris there to have a drink or three and join the locals in this time honoured activity. Several of his friends joined us and we chatted idly whilst enjoying the warmth of the evening. It is right in the middle of Sitges and we’re told it is mentioned as a place not to miss in the Rough Guide. Sitting there as the sun goes down, it is easy to understand why so many people choose Sitges as their home once work no longer keeps them in the UK. Friendship and a feeling of belonging come more easily here than in many places we have visited. Le Patio was our chosen place to celebrate Mary’s birthday on our last night in Sitges. The four of us rolled up at 8 p.m. – that’s the earliest time you can eat out in Spain – and enjoyed an exceptional experience of beautiful food, fabulous decor and outstanding service. We really can’t recommend it highly enough for something a little special without being too outrageously expensive. It has a set menu with something for everyone. The courtyard tables are surrounded by gently lit palm trees that subtly change colour, giving it a fairytale atmosphere. We loved it. 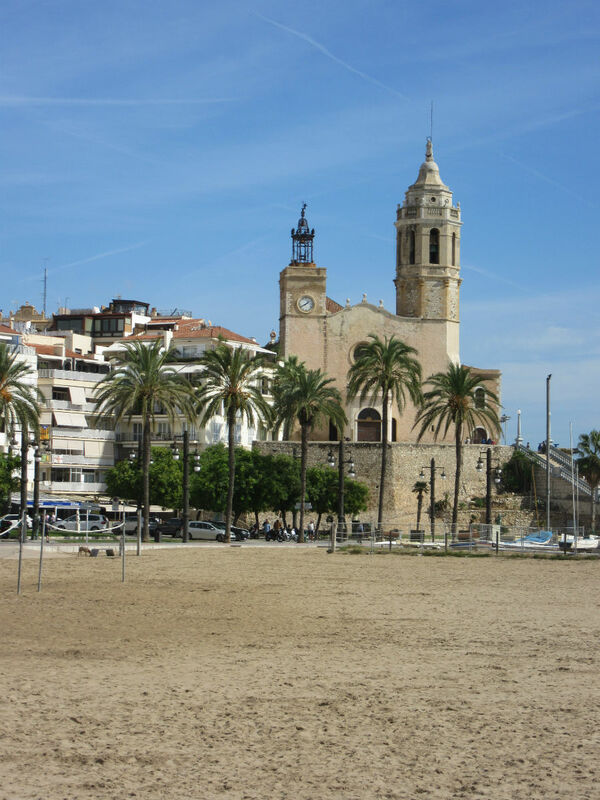 Sitges is famous for being a gay friendly resort, although it has very much more to offer than that alone. Families, retirees, indeed all types and nationalities can be found there enjoying its delights. Personally I think that the gay friendly nature of Sitges is its strength. People are accepted warmly and being a little unusual is not a problem for anyone. We saw absolutely no rowdiness or unpleasant behaviour and we felt safe the whole time we were there, regardless of the time of day or night that we walked through its streets. After three nights and two fun and sun filled days we bid Chris and Sitges a fond farewell and set off in the direction of the Pyrenees. We were having some trouble deciding which route to take – should we attempt the drive up to Andorra and then down to Toulouse? Other motorhomers had said it was a relatively easy drive but the image on the map showed some very bendy roads on the French side and, perhaps more worrying was the deluge of rainfall that was hitting the south east of France. Eventually we decided to cross the Pyrenees through the Somport tunnel, staying over at Jaca the night before and introducing Mary to the fantastic views just before the tunnel and the slightly less delightful downhill, twisting narrow roads once you are spat out into France at the other end of the five mile tunnel. On the way to Jaca we had two overnight stays. It was a holiday weekend in Spain, Friday being National Day, so our experience was slightly coloured by the fact that when Spain has a holiday almost everything closes. Cervera, our first stop, turned out to be a place we couldn’t make sense of at all. The aire for motorhomes is just off the main road next to the police station and Tourist Information. Free services, flat pitches and a number of picnic benches are provided and by evening it was very full. However – and it’s a big however – the town itself was deserted and seemed to contain very little. We found the old university where it was obvious from the posters that it was a centre of political activity for the independence of Catalonia. We read an information board that explained that the building had been a concentration camp in Franco’s time and we could hear a choir singing in the cloisters but we saw less than twenty people in the whole town square. It felt cold, being at least 10 degrees cooler than Sitges, and the atmosphere was faintly spooky. We could not understand what had brought all those motorhomes to the place as there was almost nothing to see or do. We returned to the vans, ate dinner courtesy of Mary and retired to bed for an early night and a quick exit the next day. Jaca was a bit too far for one hop so we spent another night in an unusual place. Why stop at one when there are so many to be found? St Esteban is a tiny village in the foothills of the Pyrenees that provides a carefully constructed motorhome parking on three tiers, all built into a steep hill. Services were provided free yet the village itself is tiny and seems to offer very little to attract visitors. The only clue we could get to its popularity was a café with swimming pool where, in high season, you can pay a small amount to swim all day. Two things gave us cause for concern there – the first was a motorhomer on the tier above ours who almost reversed right off the ledge onto Mary’s van. If it wasn’t for his wife shouting at him to stop it could have been a disaster. The other was the onset of torrential rains that turned the ground to huge puddles. We went to bed hoping that the structure would hold as the rain poured down the hill side. Once again the next morning we left the place without delay. After these two less than comfortable stays we were delighted to drive into Jaca in sunshine, park up in their very thoughtfully designed aire and wander the streets of the town. It’s a lovely place with interesting shops, several restaurants and bars and, to our surprise, a castle where deer are kept. We thought we would go out to eat that evening but discovered that no eateries opened until 8 pm and we were too hungry to wait. Smoked salmon and scrambled eggs with salad and fresh bread followed by Magnum ice creams were enjoyed in Mary’s van and we pronounced the whole evening a grand success. We were all tired by the time we arrived in the aire at Oloron St Marie the next morning and a bit frustrated because the navigator (moi?) had missed the turning to Intermarché where we’d intended to do our laundry. Eventually we loaded our unwashed clothes into Mary’s van and, leaving our van with the dogs at the aire, we set off together to get ourselves some clean drawers. We have paid Oloron St Marie and its outdoor laundry several visits in the past but we have only just come to the conclusion that the tumble dryer is completely pants. We have been left with damp washing every single time we’ve been there – clearly we’re slow learners. The upshot of our visit was two motorhomes full of damp washing á la Chinese laundry. All windows and doors were open to facilitate drying and I volunteered to stay behind and keep an eye on both vans while Mary, Shirley and the dogs went for a walk into town. I was rewarded for sitting under a makeshift clothesline of damp knickers and t shirts with a beautifully presented box of strawberry tarts from the patisserie to share. Superbe! Your Blog always makes me what to get my van out off storage and disappear into the wide blue yonder. Reminds me of our trip over the Pyrenees to follow the Camino back in May and June. A great read as always. Another interesting and amusing account, thanks Margaret! Totally agree with the previous comment from David as you make me want to get Donovan out of hibernation (or whatever the equivalent is in summer months!) and join you. Guessing Moissac will be your next destination…also on my bucket list thanks to you guys. Keep safe and enjoy those French patisseries and boulangeries!! Donovan is not having any new adventures this year (shame!) Would love to see more of the early Spring flowers and catch Spring migrating birds so maybe try mid Feb for a couple of months…probably begin and end France to check out the boat in Brittany. MUST do Moissac!! Great blog as usual keep the wheels turning. I need to do the Somport tunnel but every year the weather seems to be against me. Happy travels. Thanks Mike. We thought we were going to hit bad weather this time but it was glorious. Just sent pic of donkey to my daughter – it’s her strop face!